I just scratched my head. Does it itch? I really don’t think so, but now I’m paranoid because apparently there’s lice at Titus’ preschool. Lice is not something that brings any kind of joy. Just the thought of tiny little bugs running around your head is horrible. I’m sure everyone has their own lice horror story. I remember there was a big lice scare at my public school when I was in kindergarten or first grade and just to be safe my mom shaved my head. My older sisters (twins) got it worse. My mom had to comb through their hair for what seemed like an eternity with some special comb and I don’t recall them enjoying it very much. As a reminder to myself about lice, I just spent a few minutes Googling it and it’s so creepy I couldn’t stare at it anymore. Lice just isn’t nice. Bethany texted me about it this afternoon after she picked up Titus from school. She said she ran in to our friend who’s son is in Titus’ class and she told her there’s lice there. In fact, she said it happens every spring and autumn. The Czechs use Tea Tree oil as a remedy, but who really knows if that works? Just to be safe Bethany put some on Titus head today and did a comb through. At this point, we haven’t found anything or seen any signs of lice on our kids, but I really hope this doesn’t become a preschool epidemic. I guess head checks will be added to the daily routine now. In happier news, we got some mail today from the States which is always fun! 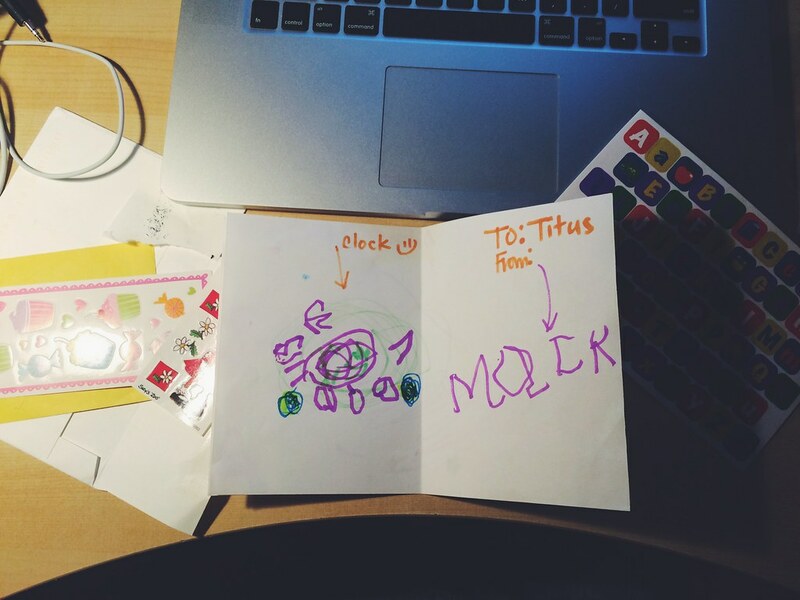 Our friends sent us a little baby announcement, stickers, and some drawings from their kids to our kids. It was really kind of them and we’re thankful for that little envelope of fun (shown above). Bethany is out tonight at a women’s Bible study. It’s been a few weeks since she’s been able to attend because we’ve all been sick for so long. Avery cried a lot for her tonight when I put the kids to bed which tells me it’s been a while since mommy has been out at night. That’s okay, though. Mommies need a little time away sometimes. I worked in a primary school for a year where we pretty much always had lice. And special needs kids are very hands on. I used tea tree shampoo and conditioner the entire year and never got lice. It’s really worth a shot!